It has been so hard waiting to share this quilt! 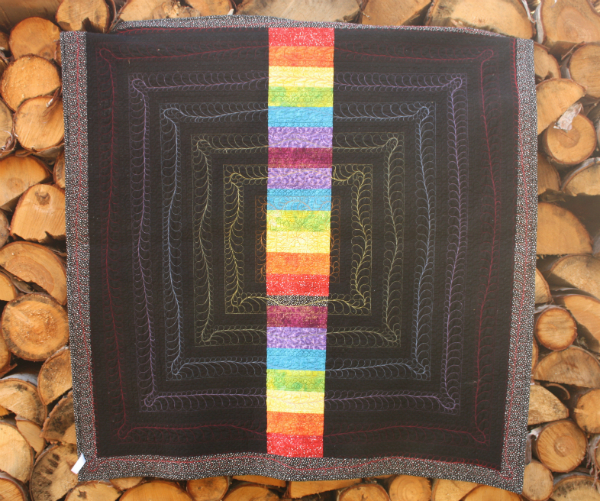 I know how much many of you love rainbows and I love how this rainbow pops against those black strips. 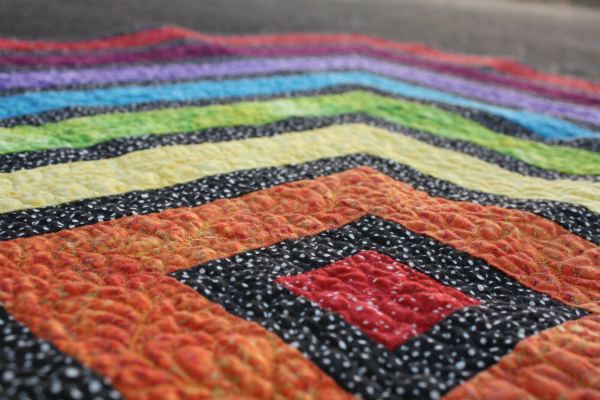 My second-ever quilt paired bright colours with black, and I've loved that combination ever since. 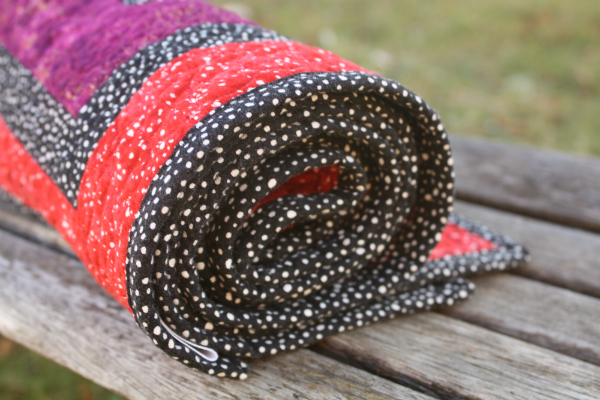 This quilt finishes at 45" square, making it a great baby quilt or wall quilt size. The backing is a lesson in the make-do nature of quilting...I really wanted to use solid black, but I didn't have enough and I didn't have time to get more since I was working on a deadline. So I used scraps from the front, along with my too-small leftover chunk of Kona black and pieced a rainbow down the center, then framed it with the black and white print from the front. 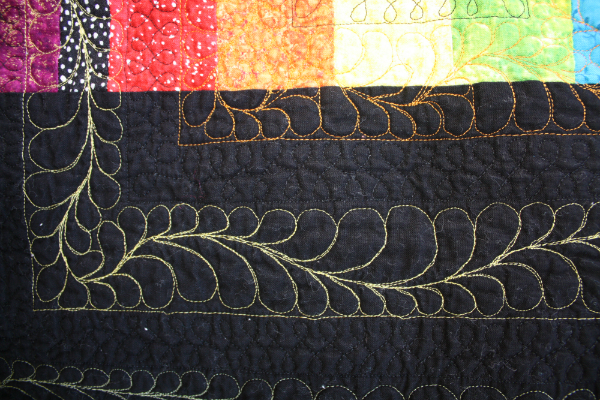 I quilted feathers in each of the coloured strips, using thread to match. Don't you love how those rainbow feathers show up on the solid black? I quilted a simple wishbone design in each of the black strips. This was the first of my finishes for the Finish-a-Long 2015 quarter 4. It was also the first quilt to receive one of my quilt labels, which you can just see poking out at the bottom of the roll in this picture. Make Modern Issue #9 is now available from Make Modern (affiliate link) and is full of other great projects and articles. Go check it out! * Edited to say Rainbow Ripple is not available for individual sale through either my Etsy or Payhip shops. Congratulations! I like the bold bright colours. And the pieced back is great. Happy New Year. Beautiful! I love the design and the quilting. 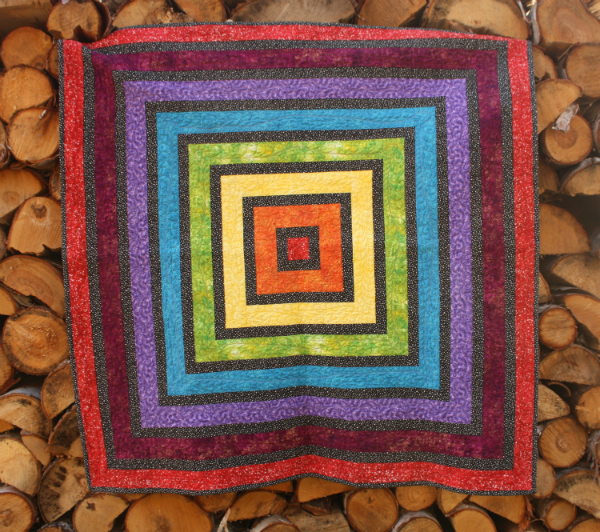 Lovely quilt Leanne, the rainbow feather quilting on the back is a great touch. Did you consider trading with the most recommended Bitcoin exchange company - YoBit.